On Sunday, July 2, in the German city of Hamburg, thousands of people went to a demonstration against the policies of the countries participating in the summit. According to the media, about 18,000 demonstrators came to the protest, but local law enforcers counted only eight thousand. The protest participants held placards with the inscriptions "Fight poverty", "Democracy" and "Planet Earth first". 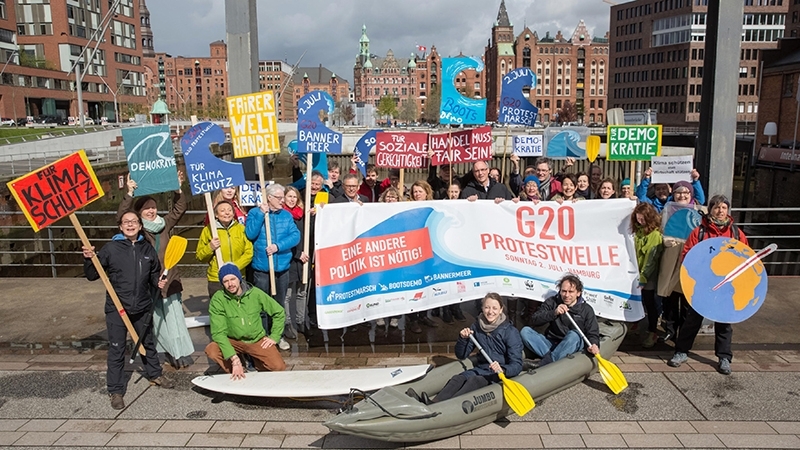 The protest took place a few days before the summit of the G20 leaders, which is to be held on July 7 and 8. Reportedly, the rally in Hamburg was the first in the list of almost 30 similar protests. Furthermore, the clashes between protesters and policemen were reported as well. On the evening of July 2, when about 600 people remained at the protest rally site, the Hamburg police prevented the demonstrators from establishing a tent camp on the Entenwerder Peninsula on the banks of the Elbe. Later the hundreds of law enforcers surrounded the territory. The police stated that the organizers had been warned in advance about the prohibition to arrange a camp. According to the representative of the police, the demonstrators threw air balloons filled with paint in the guards. The police used a pepper spray against several participants of the protest.